MILPITAS, Calif. - Nov. 16, 2018 - PRLog -- Glycerol-3-phosphate (G3P) is an important intermediate for all living organisms. Glycerol-3-Phosphate is produced either by glycerol via glycerol kinase or by glycerol-3-phosphate dehydrogenase from dihydroxyacetone phosphate. In response to cellular signals, glycerol-3-phosphate can be utilized in multiple pathways: it can be further converted into glyceraldehyde-3-phosphate and enter glycolysis, rapidly generate NAD+ in brain or muscle tissues through the G3P shuttle, or enter the lipid biosynthetic pathway. Recent studies have found that glycerol-3-phosphate is a novel regulator and plays a fundamental defense role in plant pathogenesis. BioVision's PicoProbe™ Glycerol3-Phosphate Assay Kit is a sensitive, fast and easy-to-use method of measuring G3P concentration in various biological samples. In this assay, G3P is converted into an intermediate by the G3P Enzyme Mix. The G3P developer then utilizes the intermediate to generate a fluorometric signal with PicoProbe™, which can be used to calculate the concentration of G3P in the sample. This assay kit can detect G3P as little as 20 pmol/well and can be used for a variety of sample types. 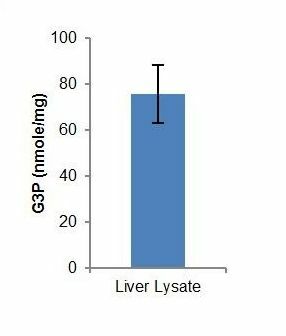 Figure: Glycerol-3-Phosphate determination in rat liver lysate (10 µg added per well) using kit K196-100 protocol.